In a previous post, I celebrated finding a DIY version of chalk paint, the name-brand version of which is quite pricey. I'd never tried the stuff, and while I'm all for jumping in feet first (graduate study in history of science and technology? Count me in! I'll think about what I'll do with that later! ), I gotta be more frugal now that I have kids to feed who can't live on ramen and pinot noir. Anywho, for those who don't know, chalk paint is supposed to be great for stuff other than walls, like furniture, because it creates an ultra-matte finish and requires very little prep. Since I can be ultra-lazy, I figure it's a perfect fit for me! This picture is stunning in real life. 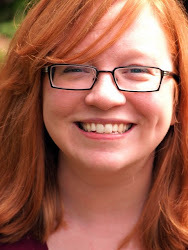 This digital copy is very gray, but the print I have is bright blue. Stunning. Wait, I just said that. Well, it is. Just accept it. I blew up the photo to 8x10 ($2.99) on Snapfish. I needed a frame, though, that would make that blue pop. I spent 30 minutes at Kohl's looking for a frame. Why Kohl's? Because I had a gift card. And for those who don't appreciate that 30 minutes is a lot of time, you try doing it with three small children. Long story short (and believe me, three kiddos in a large store can make for a looooong story), I left empty-handed. I couldn't find anything that wasn't overpriced or dark wood. So I went shopping in my house instead. And found a decent frame that needed a little TLC. Obviously, this dark wood would not work, so I was forced to try out faux-chalk-painting. Ryan was nice enough to set up my work area on the kitchen table. It was already protected by Winslow's birthday tablecloth. What else did I need? Calcium Carbonate ordered from Amazon. Not expensive. Paint. I had a sample size of "Glimmer", which is a slight slight bluish white. I poured in 2/3 cup paint. 1/3 cup Calcium Carbonate. Stirred with a plastic kiddy spoon. And then I painted. I didn't prep the surface at all. Just globbed on the paint. It was quite thick, and I chose not to add any water. Two coats on each side. Looks like something worthy of a beach house, which is fitting, since it was taken at the beach. Duh. I was going for a rustic finish, and the paint makes that look easy to pull off. Sometimes, folks choose to finish their chalk-painted pieces with wax. Since the only wax I had around was in a few candles and ears, I made the executive decision to stop at painting. Now all I have to do is pop it in the mail to my brother Ryan (remember, I'm married to a Ryan and have a brother Ryan, too, who are NOT the same person). I am not a gift-y person, and I especially balk at forced gift-giving (like if Hallmark tells me to buy something), but I liked the photo of him fishing, and thought he might like it, too. If he doesn't, he can hang it in the storage shed. Or under the deck outside. Or use it as kindling in his next bonfire and dance wildly around it. No matter, I now know I'll be painting again with this concoction. I linked up to A Bowl Full of Lemons, Type A Decorating, Between Naps on the Porch, Domestically Speaking, Sweet Little Gals, The Shabby Nest. Thanks for the recipe. I'm attracted to that "no prime and little prep" thing, too. Love that picture. Cool, thanks for the tutorial! I've also held off buying chalk paint for now, but have a killer collection of Martha Stewart paint colors from a Home Depot sale that I've been considering converting to chalk paint through calcium carbonatish means - I think this has convinced me. OOh- Love this and I DEFINEITELY appreciate the effort & toil of having 3 kiddos to haul around with you...it REALLY does get better as they get older(says a mom of 4) and now that I go about & see young moms, I have so much sympathy for you cuz I remember those days...this turned out SOOOOOoooooooooooo nice and now I'm wondering if you're still gonna gift it? 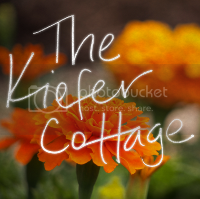 How do people find The Kiefer Cottage? Don't stop believin', I mean, learning.